A Marine credited with saving the lives of countless members of his company during one of the bloodiest battles of the Vietnam War will receive the Medal of Honor, thanks to the efforts of a congresswoman and a group of Marines who witnessed his heroics. Retired Sgt. Maj. John Canley, who lives in the coastal community of Oxnard, California, will receive the nation’s highest military honor. An official announcement from the White House is expected once a date for the presentation is confirmed. Canley initially received the Navy Cross, as well as two Bronze Stars and a Purple Heart, for his actions overseas. According to his Navy Cross citation, Canley — then a gunnery sergeant with 1st Battalion, 1st Marines — displayed extraordinary leadership and selflessness during the Battle of Hue in early 1968. Canley’s road to the Medal of Honor was a long one, requiring the intervention of several dedicated Marines and Rep. Julia Brownley, D-Calif. Ligato and his fellow 1st Battalion Marines spent nearly 15 years pushing for Canley to be recognized with the honor, only to see the effort met with more than 10 rejections. In 2014, one of the Marines reached out to Brownley, who represents Canley’s district, and it was with her help that the Department of Defense offered to review the recommendation to upgrade Canley’s Navy Cross. Darryl A. Williams is the 60th superintendent of the United States Military Academy at West Point, New York. He is the first African American to serve in this role in the 216-year history of the academy. A native of Alexandria, Virginia, and a veteran of the first Gulf War, Lieutenant General Williams most recently served as the Commander of Allied Land Command for the North Atlantic Treaty Organization in Turkey. Previously he held command posts with the Second Infantry Division in South Korea and was deputy chief of staff for the U.S. Army in Europe. In 2014, President Obama appointed General Williams to lead U.S Army Africa, where he led the Defense Department’s program to combat the ebola virus. General Williams is a 1983 graduate of West Point. He holds master’s degrees in leadership development, military art and science, and national security and strategic studies. America’s first Black astronaut received a long overdue honor earlier this month, 50 years after his tragic death. Air Force Maj. Robert Lawrence Jr., a trailblazer who opened a door for people of color in STEM, was honored on Dec. 8 for his contributions to space exploration at the Kennedy Space Center in Florida, the Los Angeles Times reported. Hundreds of people gathered at the center to commemorate him, including NASA dignitaries, astronauts, Omega Psi Phi fraternity members, and schoolchildren. After graduating high school at the age of 16, Lawrence earned a Bachelor of Science degree in chemistry from Bradley University at just 20 years old. Later, he obtained a doctoral degree in physical chemistry in 1965. In the ’60s, he was part of a classified military space program created to spy on the Soviet Union. Had he not died in a plane crash on Dec. 8, 1967, at the age of 32, he would have certainly gone on to fly NASA shuttles to space. However, his life was cut short when his F-104 Starfighter crashed at Edwards Air Force Base in California. “He had a great future ahead of him if he had not been lost 50 years ago today,” said Robert Crippen, who participated in the military space program with Lawrence, according to ABC News. Although his career was short-lived, Lawrence paved the way for other black astronauts like Guy Bluford, who became the first African American in space in 1983, and Dr. Mae Jemison, the first African American woman to travel to space in 1992. According to the Los Angeles Times, Lawrence’s family members have been fighting to get Lawrence the recognition that he deserves for decades. The Air Force would not immediately acknowledge that he was an astronaut since he did not have the opportunity to fly as high as the 1960s-required altitude of 50 miles. It also took 30 years after his death before his name was added to the Astronauts Memorial Foundation’s Space Mirror. WEST POINT, N.Y. — Cadet Simone Askew of Fairfax, Virginia, has been selected First Captain of the U.S. Military Academy’s Corps of Cadets for the 2017-2018 academic year, achieving the highest position in the cadet chain of command. She will assume her duties on Aug. 14. Askew, an International History major, currently leads 1,502 cadets as the Regimental Commander of Cadet Basic Training II. As First Captain she is responsible for the overall performance of the approximately 4,400-member Corps of Cadets. 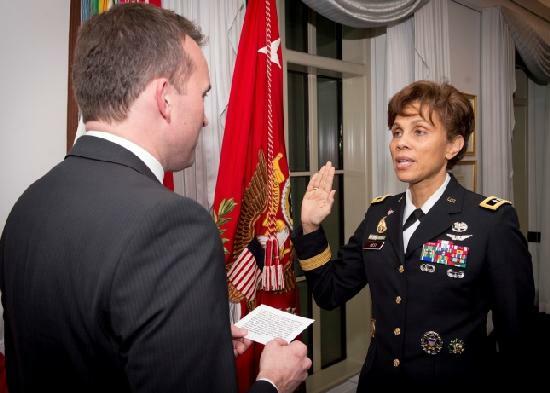 Her duties also include implementing a class agenda and acting as a liaison between the Corps and the administration. Askew is the first African-American woman to hold this esteemed position. Outside of the curriculum, Askew is a member of the Army West Point Crew team and developing leaders as the Cadet-in-Charge of the Elevation Initiative. She is a graduate of Air Assault School, an EXCEL Scholar, a member of the Phi Alpha Theta Honorary National History Society, a recipient of the Black Engineer of the Year Award for Military Leadership, and holds the highest female Recondo score during Combat Field Training II for the class of 2018. WEST BLOOMFIELD, Mich. — A Michigan woman who was believed to be the nation’s oldest veteran at 110 has died, about a month after meeting President Barack Obama in the Oval Office. Emma Didlake died Sunday in West Bloomfield, northwest of Detroit, according to the Oakland County medical examiner’s office. Didlake was a 38-year-old wife and mother of five when she signed up in 1943 for the Women’s Army Auxiliary Corps. She served about seven months stateside during the war, as a private and driver. She spent time with the president in July during a trip to Washington that was arranged by Talons Out Honor Flight, a southwest Michigan chapter of a national nonprofit that provides free, one-day trips for veterans to visit monuments and memorials in the nation’s capital. Didlake was born in Alabama and moved with her family to Detroit in 1944. She was known to her family as “Big Mama” and recently moved to an assisted living family in suburban Detroit. Filed under: blacks in the military, crossovers, Emma Didlake, Michigan, oldest U.S. Veteran, Oval Office, President Barack Obama, White House, Women's Army Auxiliary Corps.